Stream Smart – Catching the Rain! Soil is meant to act like a water-absorbing sponge. 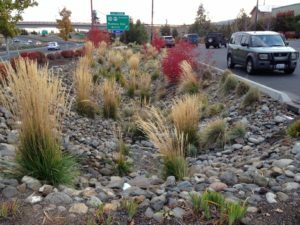 If we slow down the movement of stormwater runoff and allow it to soak into the ground, the soil will filter out sediments and chemicals from cars, yards, or pastures, which will reduce pollution entering Bear Creek and the Rogue River. Slowing down stormwater and allowing it to soak into the ground wherever possible helps maintain healthy stream flows for fish, and reduces property damage caused by erosion, which is one of the most damaging results of stormwater. Rain soaking into the ground also helps replenish our valuable groundwater aquifers. By using pavers or gravel on a driveway or parking lot, rain can soak into the earth and reach those aquifers. Rain gardens can beautify any landscape while filtering and holding onto stormwater before it enters the ground or a waterway. Consider the following variety of ways to hold onto runoff, so you too can be Stream Smart with the rain. Low Impact Development: What is it? If you have been involved in a construction project in recent years, you may have heard the term Low Impact Development, and may have scratched your head trying to determine what exactly that means. Low Impact Development, commonly referred to as LID, is an innovative approach to stormwater management that aims to keep rainfall where it falls and prevent runoff. The benefits of keeping rainfall where it falls include reduced flooding of downstream stormwater systems and natural water bodies, and reduced transport of pollutants to natural water bodies. Most of the pollution in our rivers and creeks is picked up by stormwater that flows down our streets, sidewalks, and yards, enters a stormwater pipe, and then eventually dumps right into our creeks and rivers! Homeowners can easily employ some methods of LID on their properties. Rain barrels, rain gardens, and porous paving of patios, walkways and driveways are all popular homeowner LID practices. Rain barrels are large containers, generally 50 gallons or more, connected to roof downspouts that capture a small fraction of the amount of rain that falls on your roof. The rainwater is stored for later use in irrigation. This not only reduces the amount of stormwater runoff from your roof, but also reduces the amount of water you have to purchase to irrigate your yard. Rain barrels can be found at garden stores or on-line. Grady Barrels is an Oregon manufacturer of rain barrels. The City of Portland has put together a homeowner guide to rain barrel installation. Copies of the Oregon Rain Garden Guide, a guide for homeowners, can be downloaded or purchased from Oregon State University Extension for $5. Disconnecting downspouts is another fairly simple way to stop stormwater from flowing directly off your property and allows it to filter into the ground. Downspouts are typically directly connected to stormwater systems, piping stormwater straight to creeks. 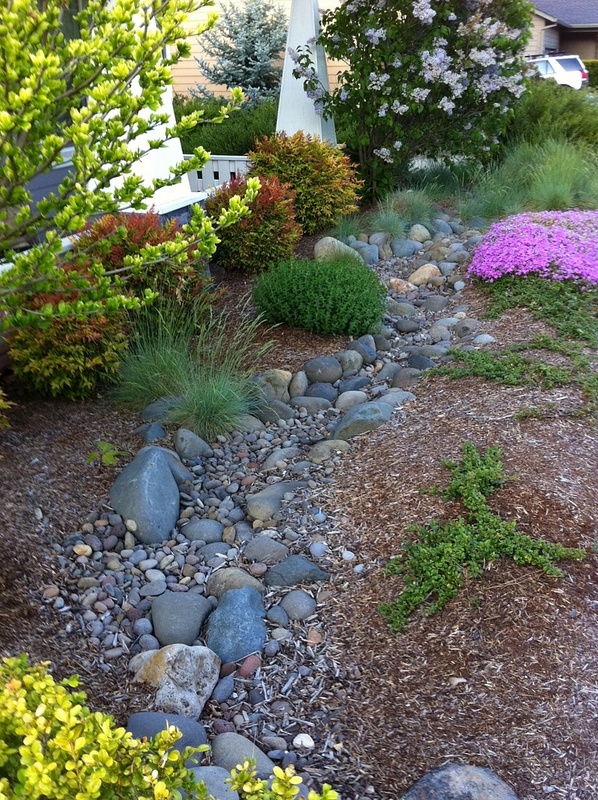 A guide for downspout disconnection is available from the City of Portland’s Bureau of Environmental Services. Check with your local jurisdiction before proceeding with downspout disconnection.